Growing up in California meant summers would be blessed with delicious hydrating watermelon in all forms. Asthma prevention: The risks for developing asthma are lower in people who consume a high amount of certain nutrients. One of these nutrients is vitamin C, found in many fruits and vegetables including watermelon. Blood pressure: A study published by the American Journal of Hypertension found that watermelon extract supplementation reduced ankle blood pressure, brachial blood pressure and carotid wave reflection in obese middle-aged adults with prehypertension or stage 1 hypertension and that watermelon extract improved arterial function. Diets rich in lycopene may help protect against heart disease. Cancer: As an excellent source of the strong antioxidant vitamin C as well as other antioxidants, watermelon can help combat the formation of free radicals known to cause cancer. Hydration: Made up of 92% water and full of important electrolytes, watermelon is a great snack to have on hand during the hot summer months to prevent dehydration. Inflammation: Choline is a very important and versatile nutrient in watermelon that aids our bodies in sleep, muscle movement, learning and memory. Choline also helps to maintain the structure of cellular membranes, aids in the transmission of nerve impulses, assists in the absorption of fat and reduces chronic inflammation. 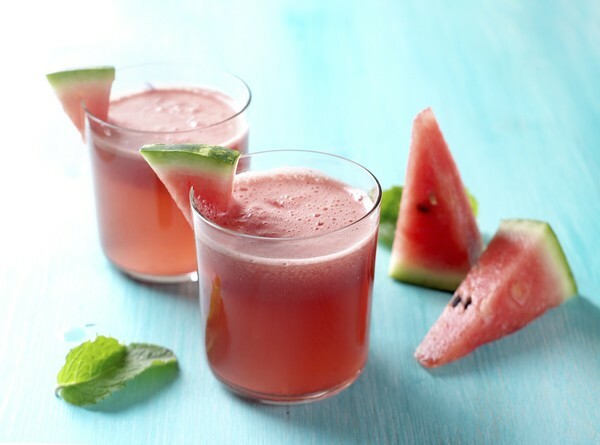 Muscle soreness: Watermelon and watermelon juice have been shown to reduce muscle soreness and improve recovery time following exercise in athletes. Researchers believe this is likely do to the amino acid L-citrulline contained in watermelon. Skin: Watermelon is also great for your skin because it contains vitamin A, a nutrient required for sebum production that keeps hair moisturized. Vitamin A is also necessary for the growth of all bodily tissues, including skin and hair.